One is the pale emperor; the prince of darkness; the antichrist superstar once known as Brian Warner. The other is a hunky A-list film actor whose latest appearance is as the mythical King Arthur in Guy Ritchie’s new film King Arthur: Legend of the Sword. 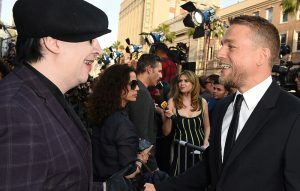 That might not seem the most obvious foundation for a friendship, but the pair of them – Marilyn Manson and Charlie Hunnam – are sort of best mates, ever since Manson appeared in Sons of Anarchy‘s final season in 2014. The post Charlie Hunnam and Marilyn Manson is the strangest bromance of the year appeared first on NME.